J.K. Rowling denounced a website that is using her name and image to pitch a workshop that promises best-seller success. 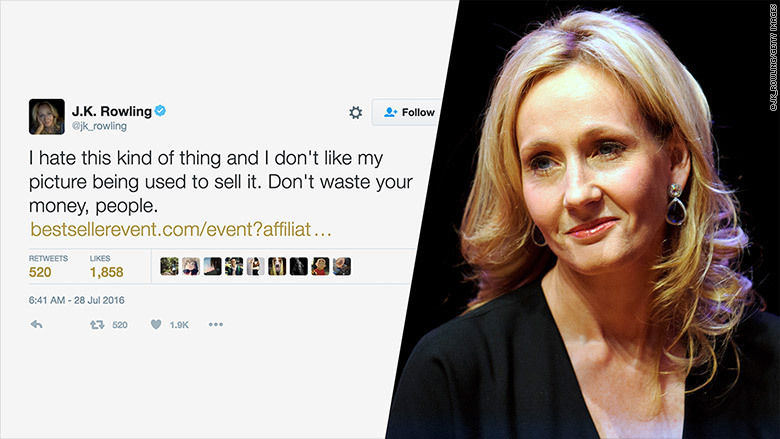 "I hate this kind of thing and I don't like my picture being used to sell it," tweeted Rowling on Thursday. "Don't waste your money, people." The "Harry Potter" author includes a link to the website bestsellerevent.com, where a pitchman named Darren Stephens advertises a $4,997 three-day workshop called "how to write a best seller and create your 6-7 figure empire." But the site is currently running a "limited offer," selling the workshop for $97. Stephens' website touts various celebrities, including Donald Trump, Bill Clinton and Richard Branson, as examples of the kind of success that can be achieved by attending the workshop. 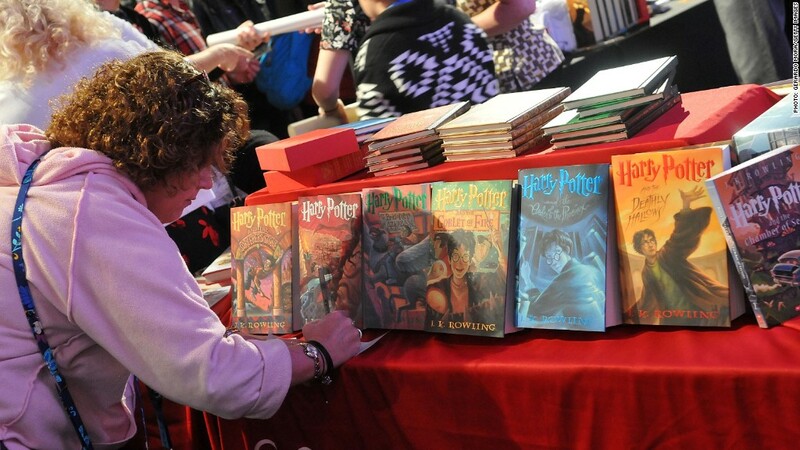 J.K. Rowling slammed a best seller workshop for using her name and image. Related: What do J.K. Rowling and Janet Yellen have in common? The site says the workshop is scheduled for Aug. 26, 27 and 28 at the Rendezvous Grand Hotel in Melbourne, Australia. CNNMoney contacted the hotel and was provided with an email address for the conference manager, but an email to her was not immediately answered. The website says that Stephens is a CEO, but does not identify a company. It also says that he's a best selling author, but doesn't name any books he's written. It's easy to understand why he would include Rowling in his roster of successful authors. Rowling's path to becoming the billionaire behind the blockbuster Harry Potter franchise is a legendary rags-to-riches tale. She was a single mother on welfare in Edinburgh, Scotland, when she wrote the first book, "Harry Potter and the Sorcerer's Stone," in 1999. It was a smash hit, so she wrote six more. The "Harry Potter" series quickly attracted an obsessive fan base, leading to a blockbuster film franchise and Universal Studios theme parks in Florida and California. She's been working on an eighth installment in the series: a two-part play about Harry Potter's dad called "Harry Potter and the Cursed Child."